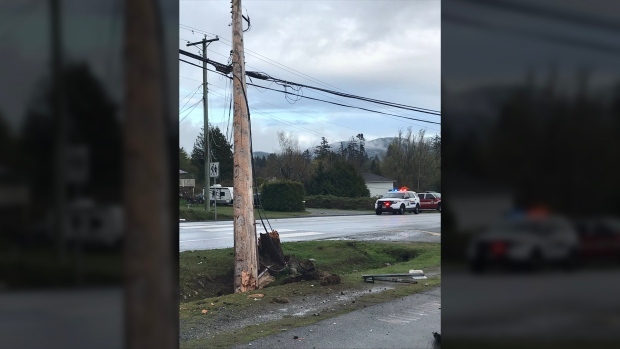 A Sooke school will remain closed Tuesday after a vehicle crashed into a hydro pole Monday night. Power was knocked out to John Muir Elementary when a southbound Toyota Echo crossed the centre line of Highway 14 and struck the hydro pole just before 6 p.m. The driver, who was the only occupant of the vehicle, was taken to hospital with non-life threatening injuries. Alcohol and drugs are not considered factors in the crash. The highway remained closed throughout the night and reopened early Tuesday, but power has not been restored to the school. "Hydro has indicated that the damage is severe and the likelihood of the school having power tomorrow is low," Principal Gord Johnson said in a statement. Because of that, students who attend John Muir Elementary can be dropped off at Sooke Elementary where staff will supervise them, the school district said. Bus service to John Muir has not been affected and will instead drop kids off at Sooke Elementary.